Throughout history, the sun has been seen as the protective deity in the sky which drives away the evils of the world. This makes sense, as most major predators in the regions where humans first evolved were nocturnal. But the impact it’s had on our creatures of legend have been colorful to say the least. From losing their powers to straight up burning apart, the sun is the great equalizer against evil throughout the world. But sometimes, the sun’s effect is a little more unique, such as with everyone’s favorite frozen friends – the Norse. It makes sense the Norse would give the sun great powers. Being in a place where the bitterness of winter can be deadly even without predators, many stories and rituals involve how awesome the sun happens to be. Even in the face of destruction, the Norse say that Ragnarok will be preceded by three years of winter – an endless time of darkness and cold before the sun itself is swallowed by a wolf. And, of course, as the days grow shorter, the Norse believed that the world was entering a time of death and the skies were being filled with a “Wild Hunt” which could take people to their doom in the night. But this time would come to an end, the sun would return and warm the world, and all would be well. And the Trolls? Well those guys just straight up turned to stone. Turning to stone, while often referenced in modern pop culture, was actually fairly unusual back in the day. Most situations with the sun involved a somewhat more violent death or a return to something else. 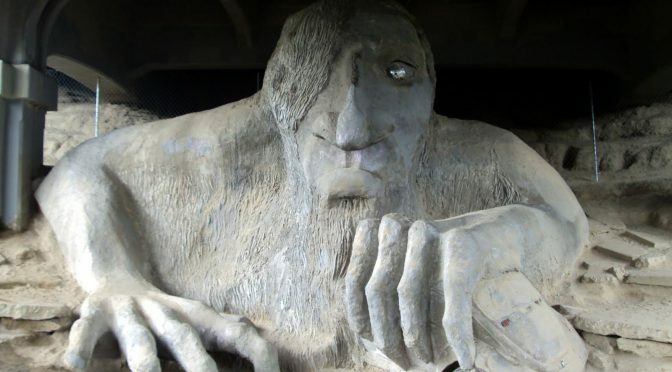 And, while some could argue that the idea was simply that the Trolls were born of stone and they were doing the same as other creatures, this wouldn’t mesh. 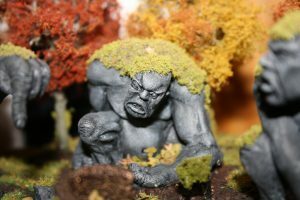 In the lore, Trolls (which went by many names) were related to nature but not actually born from the earth itself. So… why’s a little sun give the big guys a hard on? For those who’ve followed these posts for long, you probably won’t be surprised to know that some of this is about the fact that we really don’t know what the hell the Norse were talking about. Dwarves, Elves, and various other Scandinavian creatures were once very different than they are today – long ago transformed by reinterpretations over time. And, like al the other cases of it happening, Trolls are much the same. Because, as previously mentioned when talking about the impact of bells, Trolls weren’t always their own entity. They used to be Jotunn. 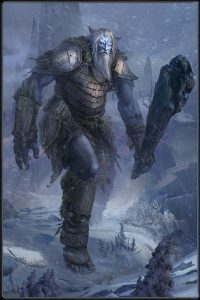 The Jotunn, Norse Giants who would often battle with the Aesir and plague mankind, have had many stories traded about them over the years. Born of fire and ice, they were primordial creatures which represented an older form of the world, before it became the more hospitable place it is today. They were thought to live in another world, connected to ours through points in caves, forests, or mountains, and would occasionally come to Midgard, the domain of humans, to torment the weaker people in our world. 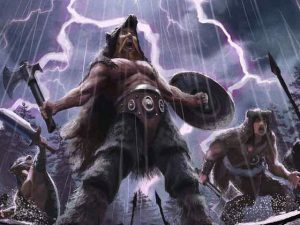 Thor, defender of the common man (and most beloved of the Aesir among farmers) would then fight them off, the sound of their battles creating the thunder in most storms. But you’d be forgiven for not knowing that Jotun were meant to turn to stone in the sun, as modern stories generally don’t mention it in relation to them. The reason for this is simple, centuries ago, as Norse beliefs fell out of being the mainstream and became a secondary religion in the area, the stories of creatures were somewhat lost and would be divided over time. Some aspects would remain in one camp, some traits would remain in another, and the oldest form of these myths would have been something in between. 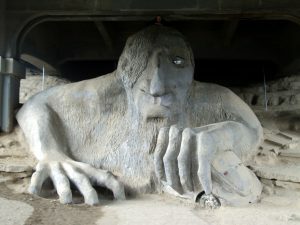 In the case of Jotunn and Trolls, these lines are particularly blurry as Trolls also receive many of the same descriptions, and, even now, may sometimes appear in the same mold as the Jotunn of old. So then the question becomes: where does the story of these creatures turning into stone come from? The sun was supposed to rise and set over all of the cosmos in Norse mythology. 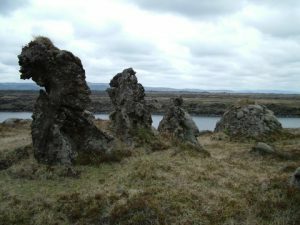 Some domains, such as Svartalfheim, would be considered to be subterranean and shielded from the light, but Jotunheim (the home of the giants) was said to be on the same level as Midgard (home of the New York Giants). Both of these were exposed to the sun, on the surface, and a real world mountainous valley in Norway is called Jotunheim even today – meaning they thought the sun could touch that land and that the inhabitants were still somehow harmed by it. But then, the fact they were gigantic raised an interesting question. if they were so huge, it’s not like they could have easily hidden in the day. Most caves are narrow and tight fits, some allowing people to move around freely, but no one the size of a Jotunn. Where could anything that size possibly hide? Clearly these entities were great enough to cause thunder as they clashed with Thor, big enough that the force of their battle could create great winds and destroy villages or bring chaos to the forests. So how the hell is it that no one had ever seen one directly, rather than obscured by clouds? None of them had ever been witnessed, directly, in daylight. They had to have gone somewhere, right? And that’s where the human condition of pareidolia comes into play. As some people know, humans are fond of finding patterns in things and recognizing them as familiar objects. That cloud looks like a bunny. That toast looks like Jesus. 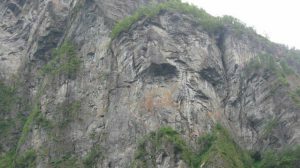 That rock face looks like a human face. We’ve all seen a mountain range that looks like someone lying down, or rocks that stack into a humanoid shape, it’s a fairly common human experience. And because of this a story has long been passed around Scandinavia for every odd formation they encounter. 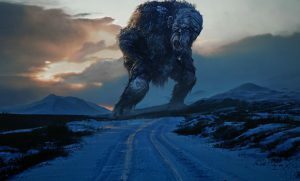 Long after Jotunn and Troll became two different creatures, the story that explained the old problem stuck to the Trolls. The story puts the old dilemma to rest in a simple way: you don’t see the giants because they’ve been turned to stone, and those faces are their corpses now sitting as an eternal memorial. They’d be hard to miss if they could still move around. I’d never heard of the Jotun before. Wouldn’t it be interesting to hear the original legends about them? It’s nice that we have scraps of them, though.